If your system and your license permit, you can speed up the run by using multiple processor cores for multi-step analyses. For example, if you have a 4-core system and want to run a 100-step Monte Carlo analysis, the 100 steps can be split across the 4 cores with each doing 25 steps. In most cases, this improves the run time by at least a factor of 3. 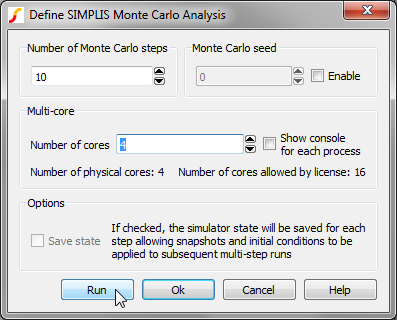 Follow the steps in Multi-step Parameter Analysis; and then in the Define SIMPLIS Multi Step Analysis dialog box, set the Number of cores to the desired value as shown below. Note: The maximum value you can set is determined by your license and system. For the allowed number of cores for each product type, see Simulation and Multi-core Processors. Start the run in the usual way for a multi-step run as explained in SIMPLIS Multi-step Runs - Overview. 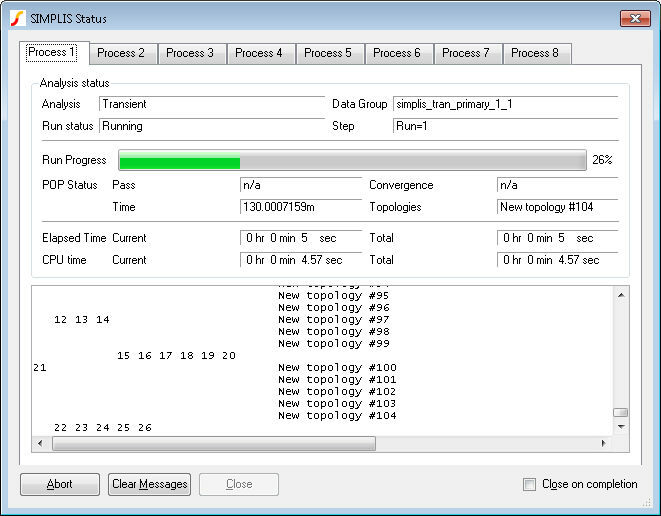 The SIMPLIS status box differs in the multi-core run because it includes one tab for each process so that you can watch the progress of each process as shown below. Fixed probes usually update the waveform viewer incrementally. That is, the display is updated while the simulation proceeds. This does not happen for multi-core multi-step runs. Instead, the graphs are updated when the run is complete.